My sail is back, and apparently, it was cut just fine by Duckworks. So now I have to figure out how to tension the lug rig right to get rid of some of those wrinkles. An interesting rig, this lug rig. Yesterday I did some sailing in Great Bay, a favorite sailing spot of mine. Coincidentally, I ran into a CLC Jimmy Skiff "Life Goal #9" built in nearby Dover. Unfortunately I left my camera at home, but "Life Goal #9" had one and took some of the first picture and video of my Goat Island Skiff putting along. Puttering along!? Indeed! More like seriously pulling away from the Jimmy Skiff! Fun stuff. What were the Jimmy's captain's comments/reactions to your Goat? Was it, "wow" or "whatever"? After reading this post I looked up CLC and I see a lot of simliarities between the two, though the Jimmy looks to be shorter. The Jimmy is over two feet shorter, has less freeboard, and proportionally carries less sail area than the GIS. 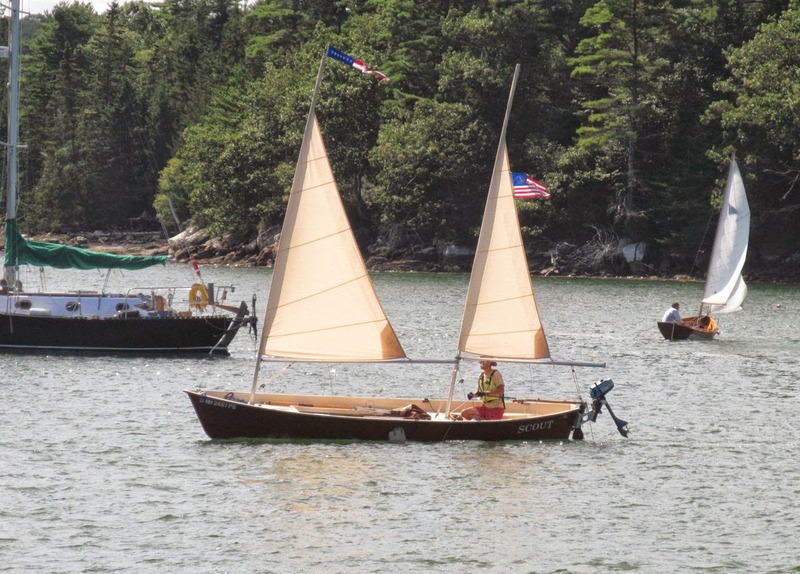 It's a good solo boat, though I wouldn't take it coastal camp cruising in Maine, for instance. This captain has taken it to Wooden Boat's Small Reach Regatta however. It's obviously a proven design, but the GIS is another animal altogether. The captain's reaction was like mine when I saw his boat... we're always happy to see new boats and talk about construction, boat behavior, etc. until our jaws fall off.